Rabbath performs a spectacular premiere performance of Proto's new Concerto No. 3 based on four of Picasso's war paintings. This disc is a CD-plus, playable as a CD-Rom on any Windows or Macintosh computer and any audio CD player. 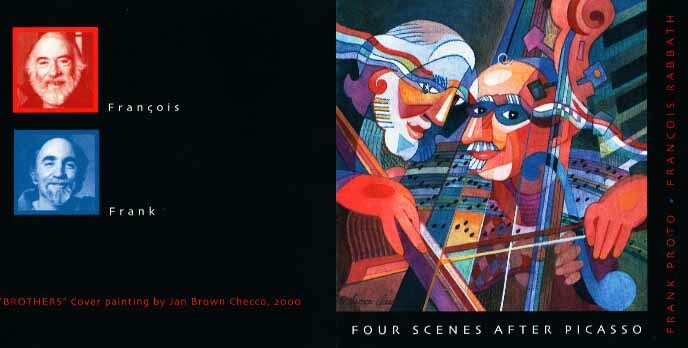 This innovative production includes movies, slide shows, program notes, Internet links and more on the music, the Proto/Rabbath collaboration and Picasso, in a highly interactive format. This disc is a CD-Plus. It may be played on any normal CD player to hear the music. It may also be played as a CD-Rom on any Macintosh or Windows compatible personal computer to view movies, articles, photographs and biographies of the artists. If you use this disc while connected to the Internet you can access many Web Sites related to the works and life of Pablo Picasso. There is also a unique connection to the Liben site that allows the user to access pages that are regularly updated to keep the information and links on the disc as current as possible. To take full advantage of this technology you will need Netscape Navigator, Version 4 or higher or Microsoft Internet Explorer, Version 4 or higher. You will also need Apple's QuickTime Movie Player. All of these applications can be easily downloaded for free via the Internet. Direct links to their download sites are provided on the disc. System Requirements: A Power PC Macintosh running System 8.0 or higher. Or an IBM compatible running Windows 95 or higher. An 8x or higher CD-ROM drive. We would like to thank David Gage of David Gage String Instruments for his generous support in helping us to release this CD-plus at a popular price.